Wolverhampton City Council says its new food waste recycling scheme has so far "exceeded projected targets". The service was introduced in January 2011 and is being rolled out across the city's 98,000 households. To use the scheme, which is optional, residents have been sent caddies to collect their food scraps in. In just a few weeks the council says 198 tonnes of waste has been collected which it says would equate to almost two million apples. Wolverhampton City Council says that food waste accounts for between 20 and 25 per cent of household waste. 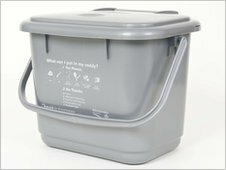 To use the new service households are being provided with a five litre small caddy to keep in their kitchen and a 23 litre bin with a sealable and lockable lid for outside. Cabinet member for Environment Cllr John Reynolds said that so far the roll-out had been "successful" and that residents were "keeping an open mind and giving it a go." "The council recognises that not everyone wants to participate which is why the service is optional. But those taking part say the service is easy to use and it's helping them to keep an eye on the food they waste and cut food bills," he added. The council says it received £600,000 from pro-recycling organisation WRAP to pay for the households in the city to have the caddies. The food waste will be used to create fertiliser and also to generate electricity for the National Grid.